The G-411 line of thimbles is basically a light-duty version of the G-414 Heavy-Duty Thimble series by Crosby. These are designed to offer basic wire rope / cable protection, and are best-suited for those that aren't using thimbles in a heavy-duty application, such as repetitive sling lifting, anchor lines, etc. 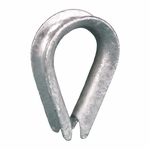 Made from hot-dip galvanized steel, available in sizes from 1/8" - 1-1/4".